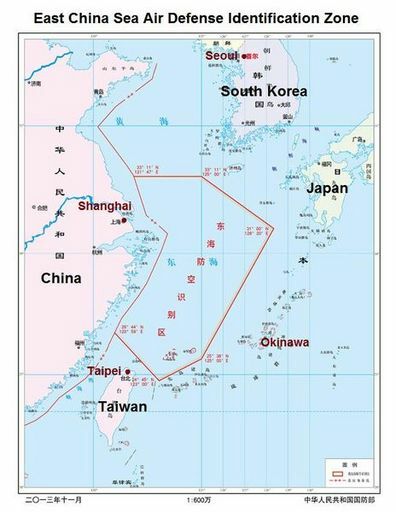 Taipei, Nov. 26 (CNA) Taiwan is "deeply concerned" about China's recent demarcation of an air defense identification zone (ADIZ) that includes the disputed Diaoyutai Islands, which are also claimed by Taiwan and Japan, an official said Tuesday. "We're highly concerned about the situation and we hope that all sides will engage in peaceful dialogue to address disputes," said Kelly Hsieh, director-general of the Ministry of Foreign Affairs' Department of North American Affairs, at a regular news briefing. Shortly after China's announcement of the new ADIZ on Nov. 23, Taiwan contacted the United States to express the country's stance over the issue, Hsieh said, and Taiwan will continue to safeguard its sovereignty over the Diaoyutais. The country will continue to stay in close contact with other concerned countries and monitor developments in the region, he said, noting that "we have been in contact with the U.S. and Japan on a daily basis." Pressed by the media, Hsieh declined, however, to give a definitive answer on whether Taiwan will accept China's ADIZ for the East China Sea and its related rules. China's Ministry of National Defense announced the establishment of the new ADIZ in a statement posted on its official website on Nov. 23. The statement came with a map and a set of rules that said any aircraft entering the ADIZ must abide by its rules or be prepared to face "emergency defensive measures." The move drew strong opposition from Japan and the U.S., with Tokyo warning of the danger of "unpredictable events" caused by the new ADIZ boundaries and Washington saying the move could cause destabilization in the region. Asked if the government would publicly deny China's right to demarcate an ADIZ over the Diaoyutai Islands, which lie about 100 nautical miles northeast of Taiwan, Taiwan's Foreign Minister David Lin said on Monday that government agencies are evaluating the situation. The Diaoyutais have been under the administrative control of Japan, which calls them the Senkaku Islands, since 1972, but the uninhabited islets are also claimed by Taiwan and China.